Alberni Indian Residential School was the scene of biomedical experimentation in the 1940s and '50s. Tseshaht First Nation wants the truth about what went on there. Place: Maht Mahs Gym, Port Alberni, B.C. The Truth! That’s what the Tseshaht First Nation and Nuu-chah-nulth Tribal Council (NTC) want. The truth about what happened at the Alberni Indian Residential School (AIRS). This past spring it was revealed that in the 1940s and ‘50s the aboriginal students at AIRS were subjected to human biomedical experimentation and deprived of food and medical treatment in the name of scientific research. Those children, now grown, and their extended families want to understand what happened at the school and why, and they want to know what lasting damage, if any, those experiments may have caused. The experiments were done without the parents’ or students’ knowledge or consent and were sanctioned by the Federal Government. In an effort to get to the bottom of this appalling and disturbing treatment, and because Canada has yet to respond to demands of the Chiefs of Canada, Tseshaht First Nation, in partnership with the NTC Tribal Council, is hosting a day-long forum to get answers to the former students’ many questions. The event will take place December 11 at Maht Mahs Gym on Tsahaheh I.R. #1 near Port Alberni. Dr. Ian Mosby, the University of Guelph researcher who ripped the lid off of the government’s illegal experiments in his paper “Administering Colonial Science”, has accepted an invitation from Tseshaht to speak about his findings at the forum. Dr. Mosby’s many revelations caused a firestorm of controversy across Canada. He will provide the forum’s Keynote Address and answer questions about his research. 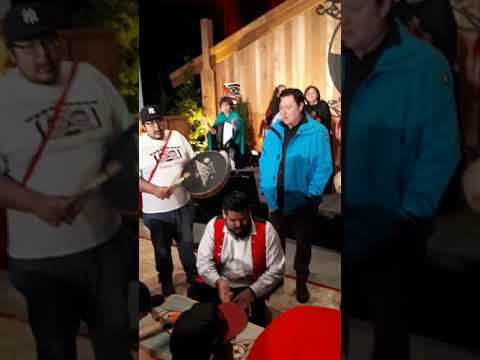 Tseshaht has also invited representatives of the Canadian Red Cross, who will explain that organization’s involvement at the residential school at the time. Both a medical doctor, to provide information about the lasting impacts of nutrition and medical treatment deprivation, and a lawyer, to discuss potential litigation, have been invited. While Canada’s Prime Minister has stated that compensation for this biomedical experimentation was included in the compensation package under the Indian Residential Schools Settlement Agreement, there is some question as to how that might be possible given that no one knew that the experiments had been conducted so could not cite that abuse in claims. “Tseshaht and other aboriginal children became guinea pigs for the Federal Government,” said Chief Councillor Hugh Braker. “These children were helpless victims for the Government’s experiments. They had been forcibly taken from their home, had no parents available to protect them, were beaten and abused in school, forbidden from speaking their language, and then the Government conducted experiments on them. This shocking treatment cannot be swept under the rug or ignored. We need to understand exactly what happened, who knew about it, who authorized it and what the effects were,” Chief Councillor Braker added. The forum will begin at 8:30 a.m. with a traditional welcome and will run until 5 p.m. Coffee, tea and lunch will be provided courtesy of the Tseshaht First Nation. Morning and afternoon light refreshments provided courtesy of the NTC. The forum will be streamed live on the Ha-Shilth-Sa Newspaper Web site at www.hashilthsa.comfor those who cannot attend. Braker said he doesn’t know what to expect regarding the number of people who will want to attend the forum, though the potential interest is huge. The children who attended Alberni Indian Residential School came not only from the entire Barkley Sound region, but from Gitxsan territories, Bella Bella, and Bella Coola. There was intense interest across Canada when the biomedical experimentation was exposed earlier this year. All of Canada was rightly outraged to learn of this further abuse of innocent children. “It’s a deeply personal concern for me as my father attended AIRS at the time of the experiments,” said Debra Foxcroft, President of the NTC. Foxcroft said she was appalled to learn of the experimentation. Foxcroft recalled that while her father didn’t talk much about his experiences at AIRS, what he did say was that the pigs and cows ate better than the students there. She said her father suffered with heart disease, diabetes, arthritis and wore dentures. Could those experiments he suffered as a child have caused, in whole or in part, any of those diseases and ailments, she wonders. “I really want to have the truth be told,” Foxcroft said. The Quu’asa team of counselors will be on hand to provide support to residential school survivors if emotions become too much to bear during the forum. Traditional brushings will be held in the Longhouse adjacent to Maht Mahs Gym. For more information about the forum, please contact Christine Hintz, Hugh Braker or Wendy Gallic at 250-724-1225.